If you're on the hunt for a casual yet sharp outfit, wear a navy blazer and Mavi Jeans jake skinny fit jeans. Both pieces are totally comfortable and will look great paired together. For something more on the daring side to round off this ensemble, go for a pair of light blue athletic shoes. 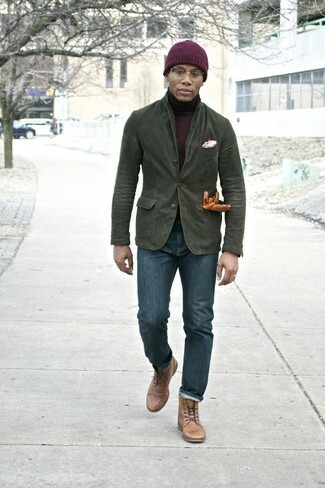 If you're on the hunt for a casual yet on-trend outfit, rock an olive cotton blazer with navy skinny jeans. Both garments are totally comfortable and will look great together. Channel your inner Ryan Gosling and choose a pair of tan leather casual boots to class up your outfit. 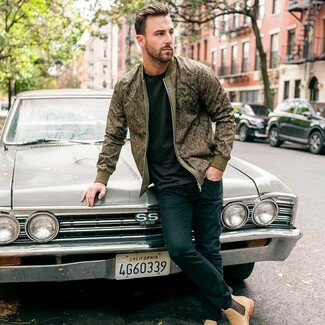 Consider teaming an olive print bomber jacket with navy skinny jeans for a bold casual ensemble that's easy to throw together. Complete your getup with a pair of tan suede chelsea boots to effortlesslly step up the wow factor of any look. 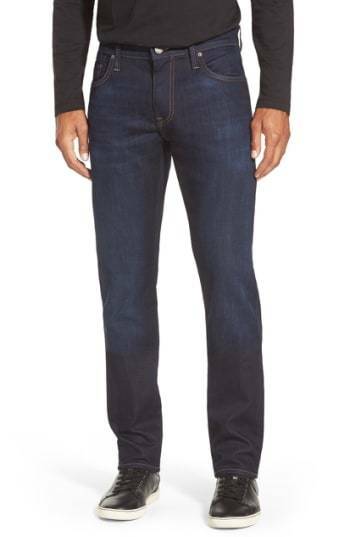 If you're all about relaxed dressing when it comes to fashion, you'll love this on-trend combination of a navy print crew-neck sweater and Mavi Jeans jake skinny fit jeans from Nordstrom. 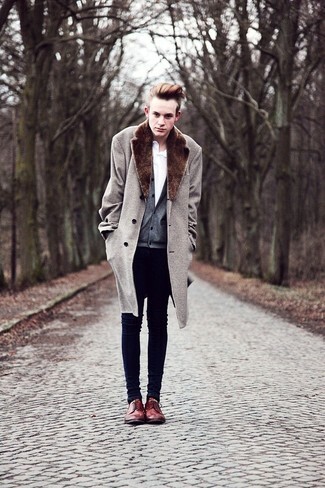 Let's make a bit more effort now and grab a pair of grey suede desert boots. For a casually elegant getup, make a black double breasted blazer and Mavi Jeans jake skinny fit jeans your outfit choice — these items go perfectly well together. When it comes to shoes, this ensemble is complemented nicely with dark brown leather loafers. 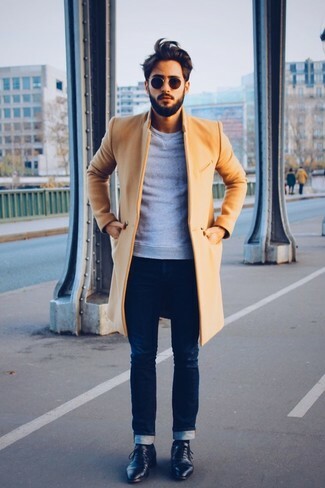 If you're on a mission for a casual yet sharp look, try teaming a camel overcoat with Mavi Jeans jake skinny fit jeans. Both garments are totally comfortable and will look great paired together. Perk up your ensemble with black leather derby shoes. If you're searching for a casual yet dapper outfit, wear a blue chambray long sleeve shirt and Mavi Jeans jake skinny fit jeans. Both garments are totally comfortable and will look great together. When it comes to shoes, this look is round off wonderfully with white low top sneakers. 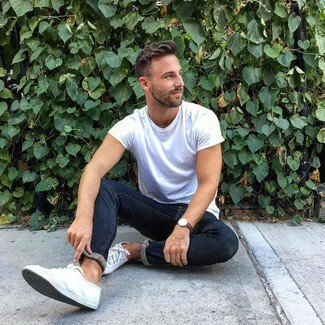 For a casual ensemble, make a white crew-neck t-shirt and Mavi Jeans navy skinny jeans your outfit choice — these pieces fit brilliantly together. Complement this ensemble with a pair of white canvas low top sneakers for an extra dose of class. If you're on the hunt for a casual yet sharp outfit, consider wearing a beige fur collar coat and Mavi Jeans jake skinny fit jeans. Both pieces are totally comfortable and will look great paired together. Channel your inner Ryan Gosling and rock a pair of burgundy leather derby shoes to class up your outfit.